I found this digital stamp while commenting on a card entered into one of my DT challenges and had to buy it. 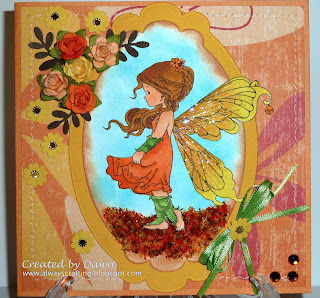 The image is from Wee Stamps and the fairies are beautifully drawn. I just had to add glitter to her wings and flower soft for the flowers under her feet. I have not used flower soft in quite a while but it is a great product for adding texture to your project. This is lovely Dawn... such vibrant colours! Thanks for playing along at For Fun Challenges! Wonderful card, cute image. Thanks for joining us at Do You Stack Up. Gorgeous card I so love that image and she really stands out from the background colour too. Thanks so much for joining us over at Kaboodle Doodles and good luck. Such a fabulous card. Thanks for joining us at Charisma this week. Wow, this is gorgeous! Love the carpet of leaves she is walking on. Thanks for making time to play in our ORANGE challenge at Do You Stack Up? this week. Good luck in the draw! So pretty! Love the image and the colors you used are gorgeous. This is FANTASTIC! Great layout and coloring!! We hope you will be back next week to join us at PIO and Catch the Bug! Dawn what a beautiful card! You put a ton of work into this young lady. Love it. The colors, the flowers, the stitching, the coloring - awesome work. I remember once that you posted that you couldn't do girly cards --- wrong! :) Please tell me how you colored the blue background. This is the techinque that I am working on now.